A Baltimore Sun/Lloyd Fox image. 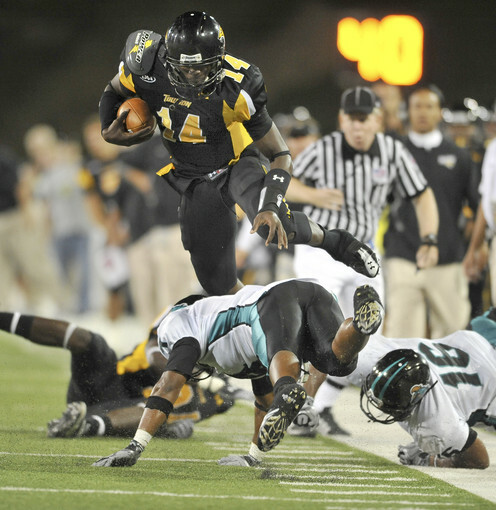 Towson QB Chris Hart leaps over the Coastal Carolina defense. The Towson Tigers are 1-3 for the 2010 season. They have losses to Indiana, Villanova and Columbia. The Tiger's lone win was over 1-3 Coastal Carolina. I was able to watch most of the Towson-Indiana game on the Big Ten Network. The Tigers stayed with Indiana into the second quarter where the score was 24-14. Indiana scored the next 30 points to pull away. The star of that game for the Tigers was QB Chris Hart (6-4 220). Hart is a JUCO from Georgia Military College. Hart went 16-125 yard rushing with a 7.7 yards/carry ave. He also threw 16-35 165 for 288 total yards against a Big Ten team. Several times Hart got into the Indiana secondary and just out ran the Indiana DBs. Hart has thrown six INTs and has a low 115.4 EFF rating. Recently Citadel transfer QB Bart Blanchard has played more. Blanchard had six series against Columbia. That's about all the good news for the Tigers offensively. The two leading Tiger running backs are Tremayne Dameron and Nygee Carmichael who have a 46.9 and 25.9 yards/game average respectively. Both backs together have only 288 rushing yards for the season. The longest run by either player this season is 12 yards. The leading receivers are Hakeem Moore with 13-352 5 TD's 88 yards/game and Tom Ryan 9-60 2 TD's 30 yards/game. The Tigers have averaged 20.2 points/game. In their three losses, Towson averaged only 11.2 points a game. Defensively, Towson has given up 163 points for a 40.8 points/game average. The Tigers defense has allowed 200 yards/game rushing. Towson's leading tackler is safety Jordan Dangerfield 21 UT 13 At 34 TT 1.5-6 TFL. After Dangerfield, it's defense by committee as the tigers have five players with 20 or more tackles. Towson cumulative season statistics here. The Tigers have no players from Massachusetts or New England. Ron Chimelis reports that senior UMass center John Ihne will miss the Towson game. Senior DT Bob McLaughlin is expected to be available after not playing against Stony Brook. Bob George of BosSports.net and a former member of the UMMB pays tribute to George N. Parks. ESPN.com has a story on Victor Cruz. the former UMass star may be the third receiver this Sunday when the Giants host the Bears. The Sports Network reports the WAC is targeting Montana and four others to fill two open slots in the league for the 2012-13 school year. If the Grizzlies jump, it will be a big loss for FCS football. Montana is one of the top five teams in the FCS/I-AA Division in attendance and fan interest. The 3-0 James Madison Dukes host the 4-0 Delaware Blue Hens this Saturday. UMass game notes for Towson: html here and pdf here. Towson game notes for UMass: html here. From the Towson game notes"Dating back to 2005, the Tigers have won nine of their last ten home games under the lights ... Their only defeat during that stretch was a 27-3 loss to Joe Flacco and Delaware on September 22, 2007." Towson is appointing a new Athletic Director today. The Dunkle Sports Index has the Minutemen as #5. Sagarin/USA Today has UMass as #84 in the nation. In Sagarin's conference rankings, the CAA continues to be ranked ahead of FBS/I-A conferences MAC and Sunbelt. UMass is ranked fourth in the CAA. NCAA.com has UMass' stats page here. The Minutemen lead the CAA in passing offense, total offense and punt returns. Nationally, UMass ranks in the Top-20 FCS stats in rushing offense, total offense, passing offense, punt returns and sacks allowed. Bad stats: UMass is last in the CAA in net punting. In national rankings we are in the bottom reaches of the Division in net punting, sacks and TFL. Current Oregon HC and former UNH OC Chip Kelly has signed a six year contract extension worth $20.5 million. The Richmond Spiders like their new stadium. However, Richmond will continue to be the only CAA school with no band. Matty Vautour says the 2010 schedule favors UMass. I still think Stony Brook has a chance at the Big South title. If they do, that would make six potential playoff teams on the Minutemen's schedule -----plus Michigan. The UMass website has excerpts from this week's CAA teleconference by Coach Morris and by Towson's HC Rob Ambrose. In The Sports Network poll, UMass and William & Mary have identical records. The Tribe lost ot UMass head-to-head. William &Mary lost to UMass and the Minutemen lost to Michigan. We are ranked one slot behind them. The FCS Coaches Poll has the same standings. UMass dropped to #5 in Keepers College Football Ratings. Keeper does have UMass by 22.09 over Towson. The CAA's weekly press release here. SeaCoast Online says both UNH and Maine need a win this Saturday. Two big games in the CAA with playoff implications this Saturday. Villanova @ William & Mary plus Delaware @ JMU. The triple option is back at our old playoff foe Georgia Southern. The Eagles had 379 yards rushing against Elon Saturday. Michigan's QB Denard Robinson had 129 yards rushing and 2 TD's against Bowling Green in five carries. The UMass Daily Collegian says UMass got over its road woes. 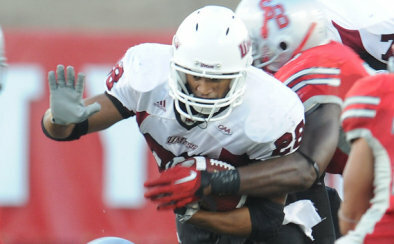 MassLive.com says the UMass tandem of Griffin and Hernandez keep paying dividends. Matty Vautour looks at some of the details from the Stony Brook game and notes UMass ran the Wildcat twice. He has three UMass stars from the Sea Wolves game. Matty also does his weekly "Road to the Playoffs" column. The Springfield Republican has a nice article about former UMass All-American and current Baltimore Ravens coach Clarence Brooks. The Sports Network said defense dominated the game between JMU and Liberty. Craig Haley reviews the state of FCS with his "In the FCS Huddle" column and says it was a September to remember. The CAA Blogger has video, stats and other news from all of Saturday's league games. Philly.com states Villanova can't afford to decline the Big East invitation. I have 34 images from the Holy Cross game in a Picasa Web album here. It contains a couple of images of George N. Parks last performance in McGuirk. I took the above image as I was walking out after the game. Look at the expressions on the band members faces. CSN's Gridiron Power Index will again be included in the NCAA FCS playoff selection process. UNH is on an eleven game home winning streak, their longest since 1929-31. Image by the UMass website. Full UMass writeup with stats, box score, notes and video here. Stony Brook's game coverage here. The Sea Wolves didn't come close to a sellout for the Minutemen. The Boston Globe says UMass avoided a big setback. The Worcester Telegram said Griffin scored the winning TD for the Minutemen. The Stony Brook Independent said UMass edged the Sea Wolves. MassLive said UMass struggled, but held on to win. Matty Vautour says the Minutemen escaped the upset. Only 5 people picked a close scoring game for the second week in a row in the Poll. William & Mary threw a TD with 20 seconds remaining to beat Maine and run their schedule to 3-1. Holy Cross fell to 1-3 as they lost to Georgetown 17-7. The Crusader offense has fallen off a cliff this year. Against UMass, Harvard and Georgetown, Holy Cross has scored a total of 20 points. Michigan smoked Bowling Green 65-21. The Wolverines rang up 721 yards of offense. Denard Robinson banged up his knee. Michigan goes to 4-0. Next week's opponent Towson lost to Columbia 24-10. The Tigers fall to 1-3. CAA standings after last night's games. Tyler Holmes does it again with another game sealing INT. UMass writeup on the game here. The Big South video worked, but it was like watching the game through an aquarium. To me, UMass looked flat out tired from the long trip to the midwest. UMass got better as the night went on and the defense pitched a shutout in the fourth quarter. The UMass defense will have to stop the Sea Wolves running game today. Click on the image and Blogger displays a larger view. The Boston Herald says the big game at Michigan has given the Minutemen confidence. The Sarasota Tribune says the USF used a lot of short hitch patterns and bubble screens against the Sea Wolves. The Bulls won 59-14. Stony Brook's HC Priore talks about the UMass game. Matty V says the Minutemen are looking to avoid the trap. The Stony Brook student newspaper says their star running Eddie Gowens (5-11 225) is questionable for the game. The Seawolves have good size on both sides of the ball. RT Mike Bamino is 6-8 350. Besides Gowins, running backs Brock Jackolski and Miguel Maysont are 5-10 200 and 5-10 205 respectively. QB Michael Coulter (6-1 210) stats 3 games 113.9 Eff 33-56-7 58.9 % 415 yards 3 TD's 67 LONG 138.3 yards/game. On defense, like UMass, Stony Brook has a 300 pd nose tackle Andrew Nelson. The trio of linebackers Julian Glenn SLB is 6-1 220. MLB Craig Richardson (injured in Brown game, but is "probable" for UMass) is 6-1 230. WLB Kenney Tuiloma is 5-10 230. SS Arin West (6-0 212) leads the Sea Wolves defense with 23 TT. CAA Game Day page for all today's league games. The Minutemen have a long history of playing poorly on the Island. We need to shake off the Michigan game and take care of business today. Brook game for a one-time fee of $5.95. Don't blame me if you end up making a $5.95 donation to the Big south, because I'll be in the same boat. Hope it works. UPDATE: I just signed up via the link above. I received an e-mail saying my credit card had been charged $5.95. So, it appears the worse case scenario is that I'm out a couple bucks. I tried logging in on their "Live feed" and it worked with my Linux/Firefox combo. WWLP22 says UMass is ready for its road test. MassLive.com say UMass is determined to win on the road. Matty Vautour says UMass wants to shake the "road" monkey. Matty's week four football picks. Ron Chemelis looks at the impact on UMass if Villanova jumps to the Big East. CSN's Terrance Thomas has his weekly "CAA Today" column here. I found this image of George over on the UMass Drumline FaceBook page. Not sure who to credit it to. Three articles from the Amherst Bulletin on George Parks editorial and here and here. Josh Buchanan has his weekly NFL stock report of FCS players moving up and down. Kyle Havens is moving up. Andrew Gaddess of The Sports Network has the weekly "In the FCS Huddle" column. He predicts a Stony Brook win over UMass. Read the article and see if you can figure out why? Over on the MGoBlue blog they are still obsessing about UMass. Read the following post on a UMass running play. I have a little different take on the play: note the blue line of scrimmage. By the time Jonathan gets to the line of scrimmage, (12:20 game clock image above) Emil Igwenagu, Andrew Kervis and Stephane Milhim have pushed the Michigan defenders three yards back. Jonathan does a quick shake which freezes the Wolverines outside contain and then runs down hill three yards in the crease. Great blocking and heady running leads to a six yard gain. The Minutemen did that all game long as Hernandez averaged 4.4 yards/carry and Griffin had 5.6 yards/carry. Speaking of Michigan, they play Bowling Green at noon Saturday. The game is on ESPN2. You could watch Michigan, follow with Richmond -Delaware on Comcast Sports New England at 3:30, then catch the UMass game at 6:00 on streaming video. Mrs Blog probably would not be happy with me if I do that. Bowling Green's HC Dave Clawson coached at Richmond and Villanova before his gig at Bowling Green. Former UMass assistant coaches Sean Spencer and Bill Durkin are on the same staff. Click on the above image and Blogger displays a much large view. 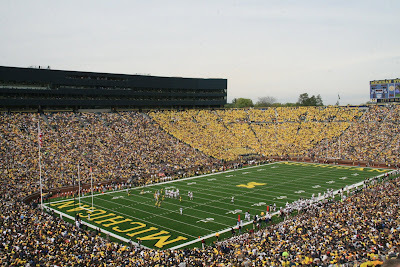 I have a Picasa web album from the Michigan game here. Michigan has dire warnings about what you can take into their stadium. "Small cameras" only are allowed. I ended up taking my SLR with a short 18-200mm (28-320 effective focal length) lens. We were up in the the nose bleed seats (row 87), so my longer zoom would have been much better for photography. It turns out the ticket taker never even glanced at my camera. FWIW, check out the album. Matty Vautour has a story on the maturation of Kyle Havens. It turns out I was looking at some of Kyle's stats last night. Blogger does not do columns, so the following may be a little difficult to read. Matty also has an injury report from the Michigan game. UMass starting center John Ihne has a shoulder injury and will miss the Stony Brook game. Quinton Sales is the likely starter. The Sports Network's Craig Haley has a preview of some of this week's FCS games as well as general news about the Division. He also has a link to a .pdf projected 2010 playoff bracket. UMass is in it. The Boston Herald says UMass was in the running for former Boston College DB Isaac Johnson, but he chose Cincinnati. The CAA website has an article on six CAA teams ranked in the Top 10. The MGoBlog breaks down every Michigan defensive play against UMass. Now that's dedicated blogging! The Maize & Brew Blog breaks down Michigan's offense against UMass. UMass has its game notes for Stony Brook up. Html here and pdf here. It appears that live streaming video will be available through the Big South Network. If I'm reading the FAQ right, you have to sign up for a month of Big South membership at a cost of $6.66. Then you would have to cancel membership after the game as they automatically renew your subscription. Stony Brook's game notes for UMass here and pdf here. 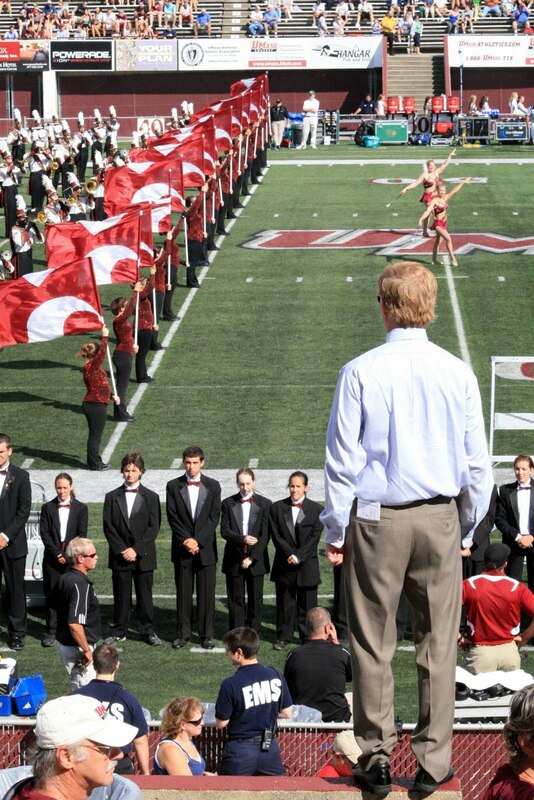 UMass has a memorial page up for UMass Band Director George N. Parks. There is also a Facebook memorial wall. UMass WR Anthony Nelson will be playing against five former teammates when he plays at Stony Brook this Saturday. AnnArbor.com looks at Michigan's running game defense. Key quote from the article:"If UMass had come in and run some funky Air Force-style wing formation where the ball is hard to follow, (Greg) Robinson would get a lot more blame. But that didn’t happen. The Minutemen essentially said, 'We’re going to try to run the ball down your throats and see what happens.' And what happened was really, really scary." Delaware's Pat Devlin will play at Richmond Saturday despite having a fractured left (non-throwing hand) wrist. MassLive.com reports UMass jumped to #11 in The Sports Network Poll. The Minutemen jumped to #9 in the FCS Coaches poll. Matty Vautour has news about UMass' jump in polls. The Sports Network says Villanova leads a strong CAA contingent. The Dunkle Index has UMass at #3. Ron Chimelis says UMass one-upped UConn. The Detriot Free Press said Michigan may have had a letdown. Michigan LB Craig Roh says the Wolverine defense was terrible against UMass. AnnArbor.com says Michigan's defense is getting worse. More from yesterday's Michigan press conference. Key quote from the article:""We just didn't tackle well, and they threw some stuff at us that kind of frazzled us," Roh said. " 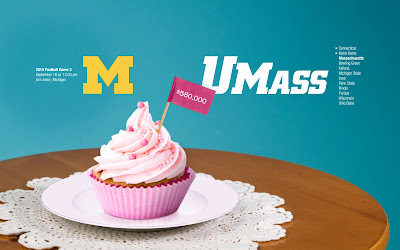 Maize & Brew Blog says "They (UMass) were who we thought were"
The image about was from one of the Michigan boards. I forgot which one. The cupcake gave the Wolverines defense an upset stomach didn't it? Delaware's Andrew Pierce received the CAA's Offensive Player-of-the-Week. He ran for 200 yards and two TD's-----against Duquesne. UMass' Hernandez and Griffin run for 211 yards and two TD's against Michigan and they don't get the award? University of Wyoming has only 67 scholarship players. That's only four more than FCS teams. The Cowboys lost 56-6 to Boise State Saturday. When college mascots go bad. I like this AP image from the link below. It's emblematic on how UMass' offense was a couple steps ahead of the Wolverines defense all day. UMass beat writer Matty Vautour has three stars from the Michigan game. He updates he weekly "Path to the Playoffs" column. Ron Chimelis say UMass removed all doubt about its ability. SI.com, in a story that barely mentions UMass, talks about how badly Michigan played. UMass may have had something to do with it. MLive.com says Michigan has a long way to go. The Maize & Brew Blog asks "Hung over or exposed". The close win over FCS UMass cost Michigan one spot on the polls. The Wolverine Blog does a classy post on UMass' loss of George Parks. The UMass Daily Collegian has an article on Dr. Parks and some news about the band. UMass stays at #3 in Keepers College Football ratings. He has UMass by 30.13 over Stony Brook. Another computer ratings site has UMass at #4, down one because of the loss to the Wolverines. BTW, the Sea Wolves lost to Brown in double overtime. 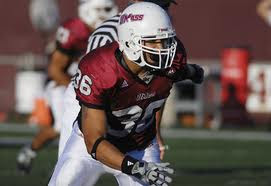 Former UMass great Steve Baylark has been signed to the roster of the Sacramento Mountain Lions. Special thanks to a blog reader for alerting me about this. The Manchester Leader covers New Hampshire's loss to URI, who had a twelve game losing streak going. The CAA Blogger has updates on all Saturday's games. One of the commenters mentioned the excellent coaching by UMass staff for the Michigan game. The UMass Blog concurs. It looks to me as if Coach Morris, Coach Picucci, Coach Dudzinski and all the rest of the staff gamed just about every ounce of advantage out of what UMass had to offer. Take a bow coaches! Note that the Michigan coach made a point of going to the UMass locker room and praising Coach Morris and the team. Klick on the image and Blogger displays a much large view. More on the pregame tribute to George Parks. Matty Vautour says the band played on. He also said UMass was close. The Detroit Free Press says UMass was an onside kick away from winning. The Boston Globe says we nearly brought down the house. AnnArbor.com says both Denard Robinson and Kyle Havens deserve three game balls. The Michigan Daily found Ke'Mon Baily's pregame comments no longer comical. The Detroit Free Press said Michigan's special teams and defense struggled. UMass had a good turnout at Michigan. I saw most of the UMass Die-Hards. There were even some who looked like students. I don't know if the team could hear us, but we made some noise. At one point during the game, the Michigan announcer gave the attendance. 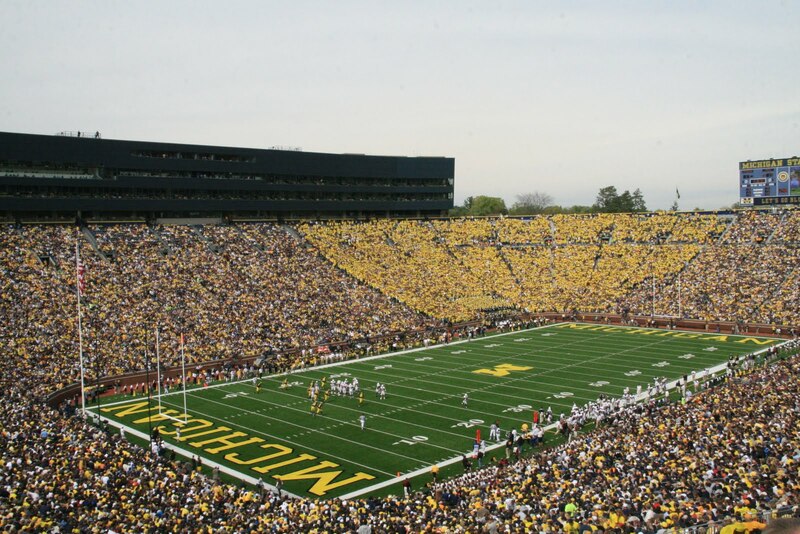 It was the 217th consecutive game at the Big House with more than 100,000 attending. Then he added: "This is currently the largest group of people watching football anywhere." UMass out gained Michigan 26-22 in first downs. The Minutemen averaged 4.4 yards/carry and had 439 yards of total offense----- easily UMass' best offensive effort against an FBS/I-A team. The UMass Blog was at Richmond last year when Kyle Havens had a terrible game against the Spiders. Yesterday, was Kyle's redemption as he went 22-29 222 2TD's. Tell Kyle he was the best FCS/I-A QB in the nation yesterday. 93-B. McLaughlin, 94-C. Violette, 96-B. Levengood. Michigan is going to hammer Bowling Green. One said "If this was Ohio State, they'd be torching your car". over a very good Big Ten team. 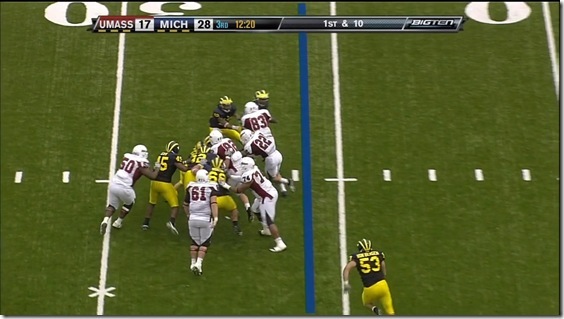 contain Denard Robinson's running first. To me, it looked if UMass DB's had to do a lot of one-on-one coverage. I think that was the reason whyMichigan was able to complete some of those long passes. Kudos to the UMass defense, who battled all day. our UMass gearand made it a point to come over and say "Hi". Prior to the game the Michigan announcers told about the death of George Parks and asked for a moment of silence. One hundred ten thousand people went totally quiet and many stood and removed their hats. The Michigan band played "Fight UMass" in their pregame show. During halftime the announcers again told about UMass's loss. The Michigan fans gave a great reception to the UMass Band. After the game, many Michgan fans noticed our UMass gear and every one was quick to say "Great Game by UMass". A good number made it a point to express condolences about George. Today was great football experience and a good part of that came from Michigan and Michigan fans. The Big House is special and today so were all the Michigan fans. Thank you! From this UMass fan------ "Go Blue!" News and views about the game tomorrow morning. More tributes to George Parks continue to pour in. The Boston Globe says George Parks transformed, brought fame to UMass Marching Band. The Boston Herald said George was beloved. UMass beat writer says UMass football enters the Big House. The Detroit Free Press has things to watch for in the UMass-Michigan game. The Free Press says Michigan does not want UMass to turn into Appalachian State. The Boston Herald says UMass faces a big obstacle. AnnArbor.com says parity in college football is increasing. Ke'Mon Bailey apparently wants to hype some interest in the game. It certainly generated some ink for UMass football and the Michigan administration is probably happy that it will inspire Wolverine fans to stay motivated and show up for a FCS game. My WiFi connection here at the motel is really struggling, so I'll close for now. BTW we're seeing quite a few people wearing Maroon & White in the plane and in the motel. Image from the William & Mary game. 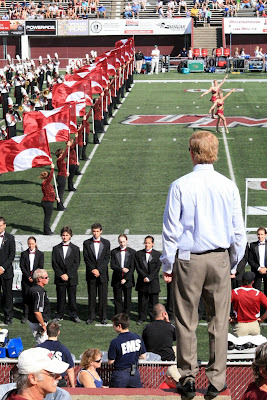 The UMass Blog is saddened and shocked to hear that George N. Parks the nationally known UMass Band Director died of a heart attack while traveling with the band in Ohio. Game Day at UMass has been changed forever. UPDATE: 11:00 PM UMass website with a statement fromChancellor Holub about the loss of George Parks. The Boston Globe says "Thank you Mr. Parks"
The Detroit Free Press says the UMass band will play Saturday. MassLive says George felt the Band's performance at Michigan would have been a "pinnacle" in his career. MassLive also has some comments and memories from the UMass and UMass Marching Band community. The UMass Band's decision to play tomorrow is the correct one. I am absolutely sure George would have expected everyone to carry on the tradition he created. Guest Blog from "Maize & Brew"
I had a chance to swap questions and answers with Maize&Brew Dave who runs the excellent Maize & Brew Michigan Blog. UMass Blog:The Maize & Brew is a great name for a Blog! While visiting Ann Arbor, UMass fans may have the occasion to be thirsty. Can you recommend any places to remedy that problem? MAB:Thank you, my friend. As you can guess, the name was inspired by a certain love of malty, hoppy beverages, so I can suggest a place or two to partake. My personal favorite is Ashley's. 70 plus taps. Great food. But get there early. There are two TVs in the place so don't go there planning to watch a game. Go there planning to drink outstanding beverages. Next on my list is Grizzly Peak, for a higher quality meal, and outstanding home brewed beer. The big oak bar, friendly people and great pub and german food. this is a can't miss if you like good craft beer and better food. If you're looking for a complete list of great things to see and places to eat in Ann Arbor, check out Maize n Brew's 100 Reasons to love Ann Arbor. Click through, there are plenty of places to eat and drink that you'll love. If you want an incredibly greasy burger, Blimpy Burger is your one stop shop. Ask for the fried egg on top of a quint. Ah here we go. As game time approaches there are many things you're going to want to do. 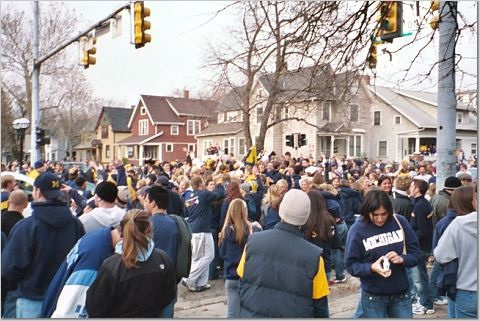 A recent innovation in the ever expanding list of Michigan traditions is the "Victors' Walk". 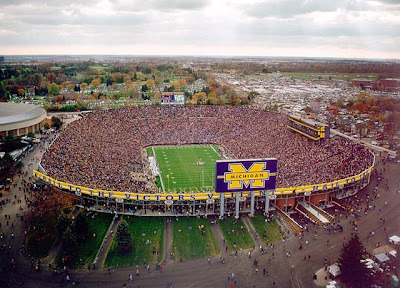 The Victors Walk was started by Rodriguez as a way to get the fans fired up before games and allowing the fans the opportunity to give high fives and cheer on the Maize n Blue before the entered the stadium. Everyone who's gone has said nothing but great things about it, and it's worth your time to see it at least once. The walk usually occurs about three hours before game time. For the musically inclined, the Michigan Marching Band does it's final warmup and march to Michigan Stadium around 11:30-11:45am. If you love the pageantry of college football, this is something you must see. Now, aside from some of the festivities surrounding the Band and the Team, there's still a lot to see in Ann Arbor. If you get there early enough, I'd recommend walking through the Diag and to the Union just to see the sites. The Union is still one of the Grande Dames of the Big Ten's architecture and the Diag is as classic a collegiate setting as you will ever see in your life. For merchandising, our buddies at Underground Printing have the hook up as well as our friends at the MDen and Moe's Sports Shop. But as we get closer to game time, if you want to see a mass of humanity united in a single endeavor you must, MUST walk down State Street to the point where it meets Hoover Street. The intersection of State and Hoover has turned into a traffic nightmare but a tailgating party dream over the last few years. The streets are literally clogged with collegians partying, drinking, dancing, and listening to music that I listened to more than fifteen years ago. Yes, Humpty Dance/Bust a Move/Anything by Blondie were already old when I went to school; and yes, they're still being played. As you turn down Hoover toward the stadium, it's a sea of humanity. Then, you arrive at the stadium. Make sure you arrive about a half hour prior to game time so that you can see the team Touch the Banner and the Band make the pre-game Block M on the field. These last things are post tailgate, and things you should do anyway. UMass Blog:My copy of the Sporting News 2010 College Football preview magazine has Michigan picked #8 in the Big Ten. That was BDR (before Denard Robinson). Tell us about him. You had Superman on your team last year and didn't play him? MAB: Heh. Yeah. But Superman didn't learn how to throw the ball until this season. Denard was one of those incredibly gifted athletes that never really received position coaching until he got to college. Everyone knew how fast he was. Everyone knew how strong his arm was. But getting those two attributes on the same page took a while. With a full season under his belt, Denard finally had the game slow down for him and he finally had the chance to receive some basic QB coaching. The result has been awesome. But before people forget, it's not like the guy ahead of him is chopped liver. Tate Forcier was a really good freshman quarterback. It's not a case of someone losing a starting job. It's one of those kids, Denard, winning it. And that's what's gotten Michigan fans so excited. Just as a final aside, Denard really is a great kid. UMass Blog:From what I've been reading Michigan has been having some injury problems especially on defense. Will that be a factor against a FCS team like UMass? MAB: Your guess is as good as mine. Michigan's defense is a huge question mark this season and it's not like we haven't had problems defending against FCS opponents before. Here's the thing, we lost our most important starter before the season even started. So at this point there's no "OMG Whatawedo!?" going through the program. There aren't any starters from the last game that will be out for this week, so I don't think there are any problems that would effect Michigan more this week than any other week. UMass Blog:In preseason, UMass was also picked 8th in our league primarily because we only returned only nine starters. It seems we have filled those places with some pretty good players. UMass fans are thinking playoffs. With the stellar play of Robinson, what are the upper limits on the hopes of Michigan fans? MAB :Like you guys, a hot start fuels a lot of optimism. Michigan fans, at least those with short memories, are already practicing Denard's Heisman speech. I'm not quite that drunk on the Kool-Aid.... yet... Robinson's play has actually been beyond anything we could've hope for from the QB position but it's also shown us how reliant we are upon him. So, with little non-Robinson related production, I can't bring myself to go beyon my initial 7-8 win prediction for the Wolverines this year. Do I think there's a possibility that Michigan could get to 10 wins? Sure. It's a possibility. But it's equally possible the wheels could fall off like they did last year. So this season I think most Michigan fans are holding their breath and keeping it realistic. The Detroit Free Press say Michigan is not overlooking the Minutemen. 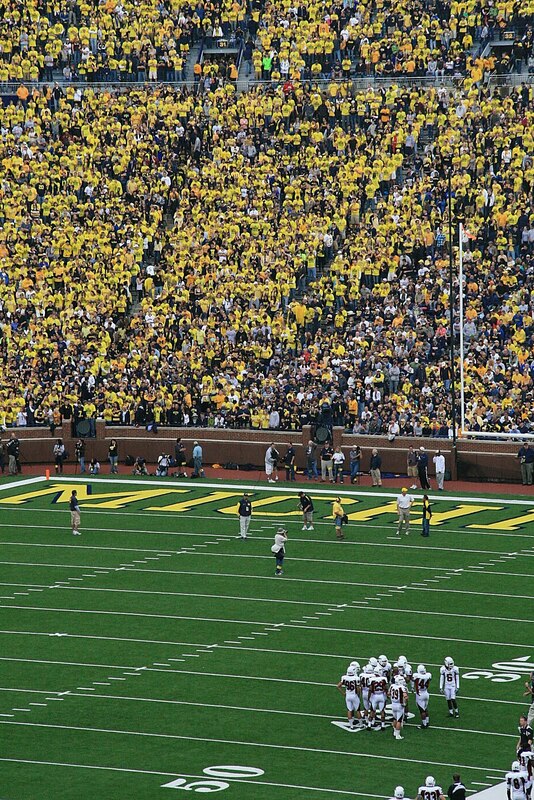 The Greenwich says Michigan insists it's not overlooking UMass. The Livingston Daily says the Wolverines are wary of UMass. MassLive.com says the chase will be on when UMass tries to contain Denard Robinson. They also say a bunch of UMass diehard fans are making the trip to Ann Arbor. MassLive has three keys to beating Michigan and Denard Robinson. Kryptonite? Ann Arbor.com has some material about UMass including the fact that the town manager of the town that the UMass band was giving an exhibition yesterday played for George Parks in the UMass band. Matty Vautour says the Minutemen are preparing for a huge crowd. Some notes on this sad morning, I was programming my DVR for the Michigan game and found none of the Dish channels were carrying the game live. The only time it was available was a replay at 1:00 am on Sunday morning. Don't program your VCR or DVD without checking actual schedule in your area. Under the FWIW catagory. If any UMass fans are driving to the game and looking for a place to park or tailgate, I received the following in an e-mail. I own a parking business not far from Michigan Stadium that has great tailgating spaces and is very opponent-fan-friendly. We had hundreds of UConn fans here a couple of weeks ago and they had a great time. f you don’t mind, please spread the word to UMass fans on your blog. Our parking business website is www.michiganfootballparking.com. I actually operate a lumberyard on the site but on football Saturdays we become a football parking lot. Woah! The UMass Marching Band will play at Michigan! The Detroit Free Press says the Wolverines are not overlooking UMass. MassLive.com says it's a different world out there. They also say Michigan is taking the game seriously. WWLP22 says the football field at Michigan is still the same size as in FCS. The UMass Daily Collegian says UMass is looking for an upset. They also say UMass has a major task in containing Robinson. Another Collegian columnist says the UMass Football team is already winning. AnnArbor.com says the Minutemen want to follow the same path as James Madison. The Detroit News states UMass is excited not awed. 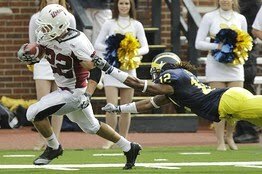 UMass fullback Scott Duggan has been a lifelong Michigan fan. The CAA weekly press release with all the league news here. The league site also notes the CAA has seven teams ranked in the top sixteen in FCS. Craig Haley has the latest news from the FCS division in his "In the FCS Huddle column". Josh Buchanan looks at the results of the 2010 FCS NFL Draft. They also have Michigan at #30, which is not going to make Wolverine fans happy. Wow! Things have really been jumping here at UMass Football Blog Central! Blog traffic has doubled in the last week. I'm getting pro and anti Michigan e-mail. The trip to the Big House has certainly created a buzz about UMass football that I've never seen before. Let's keep it up. Go UMass! UMass' game notes for the Michigan game are up. Html here and pdf here. Michigan's game notes for UMass here (pdf). Matty Vautour says the mission for the UMass defense is to knot "the shoelace". Matty also states NFL-quality opposing players are no strangers to UMass. MassLive.com talks about UMass' LB Tyler Holmes. The Cal State Fresno student paper says UMass' goal is to keep Denard Robinson off ESPN's Top 10 plays-of-the-week. The Toledo Blade says there is nothing small about Michigan's matchup with UMass. ESPN has an article on the strong play of FCS teams against FBS teams this season. Here's hoping UMass adds the list. CBS.com says there is only one leader in the Heisman race: Michigan's Denard Robinson. The Sports Network has an article about Old Dominion's first game against a CAA team. The CAA's website has all the game notes for this week's CAA games. The Reception will take place at the University of Michigan Golf Course (500 East Stadium Blvd) from 9:30am - 11:30am in the Club House. No tickets will be mailed for this event. Please bring your confirmation for registration check-in at the Golf Course. The Golf Course is a short walk to the stadium.Frank's note: I believe this event is only for people who bought the travel package . *Stadium Policy: The University of Michigan has very restrictive policies regarding what items may be brought into Michigan Stadium on game day. Specifically, NO BAGS OF ANY KIND (purses) are allowed into Michigan Stadium. Umbrellas and seat backs are also prohibited. 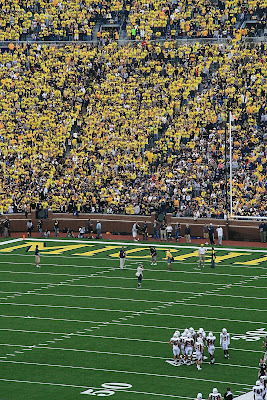 For additional stadium policies, please visit the University of Michigan website: http://www.mgoblue.com/genrel/060109aad.html"
AMHERST, Mass. -- Looking for the UMass at Michigan football game on television? Or what radio dials you can listen to the game on this Saturday. The game is being televised live nationally on the Big Ten Network in HD. 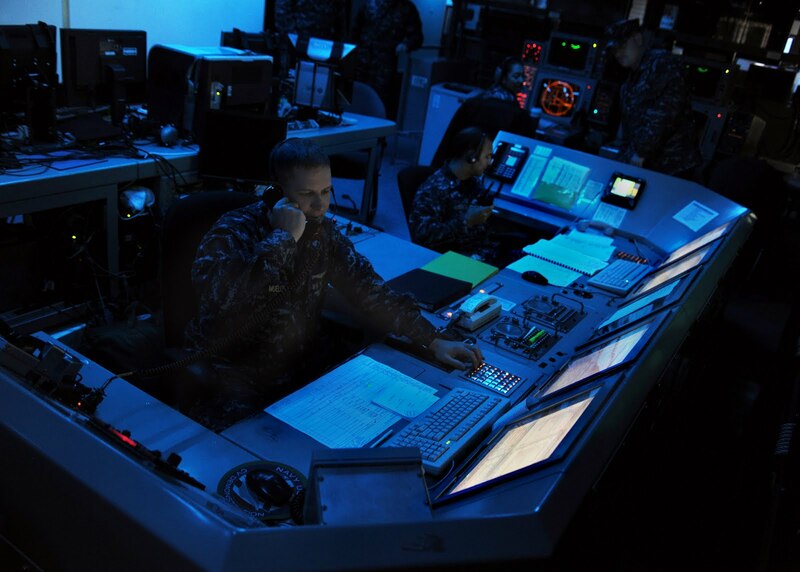 It will be carried on DirecTV, Dish Network and Comcast Cable. Also, the game will be carried statewide on the UMass Sports Network with a radio broadcasts. All your info can be found here. For television coverage, simply enter your zip code to see where and how you can receive the Big Ten Network on the BigTenNetwork.com Gamefinder page. On DirecTV, the game will air on Channel 612 and 612-1. On Dish Network, the game will air on Channel 5441 and 9502. On Comcast Cable in Massachusetts, the game will air on Channel 285. Charter Cable does not carry the Big Ten Network. AMHERST, Mass. - The UMass Athletic Department will be holding a "Watch Party" for the UMass-Michigan football game on Saturday, Sept. 18 at Arizona Pizza Company at the Hampshire Mall in Hadley. Head basketball coach Derek Kellogg will be at the Watch Party to meet and mingle with the UMass fans. Come out at 12 noon to watch the Minutemen and Wolverines battle on Saturday. The game will be airing on the Big Ten Network. For more information, please call the marketing office at 413-545-1401.